It has been a few weeks since I returned to Monterey from a long summer spent in the mangrove forest of Rincon del Mar, Colombia. I took a risk by choosing to work on a rural first-of-its-kind conservation project for South America over a well vetted ‘big box’ agency or office job, and although it didn’t turn out how I had envisioned, I don’t regret my decision at all, especially after a few weeks of reflection. 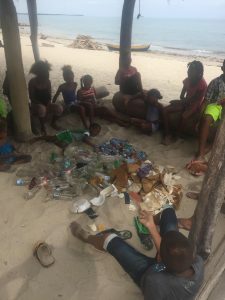 I set high expectations for myself and I wish I could say that I left Rincon with a pristine plastic-free mangrove and a thriving fishing community, but that is not the case. Instead, I received a strong dose of adversity and a taste of what it might actually take to protect our ocean and coastal resources worldwide, especially in all the areas so far away from the spotlight. In hindsight, this may have just been the most valuable experience possible – a “forward failure” some might say. It is with the utmost gratitude that I thank the Center for the Blue Economy and its donors for making this enriching opportunity possible, this summer was truly unforgettable and something that will forever inform my future work. A lot happened since my last blog post. I realized just how much effort it takes to not only do good work as a small organization in a developing country, but to even stay afloat financially in hopes of doing impactful work in the first place. Put in other terms, I quickly became familiar with grant writing and asking for money to save ourselves and our planet, a sad but true reality of this field. In fact, constant pressure needs to be endlessly applied in order to uphold the efforts of ocean, coastal, and environmental stewards, and all too often it only takes a few pen strokes to undo those endeavors. My work with the E2E Foundation, a small and lean Colombia based non-profit, has redirected and clarified my professional interests in many ways. Although it will almost always require a local effort and community buy-in to make a conservation project successful, I now know with certainty that top-down policy leverage will be required as well. This summer solidified a desire to be at the confluence of science and said policy-leverage, where I can nurture awareness, cultivate change, and lead a wave of environmental reform that I believe is quickly approaching. Environmental issues like marine plastic, sea level rise, and a warming climate know no borders, and in this day and age, I’m not sure that local conservation efforts alone will keep the mangrove trees standing and fish populations sustaining. What I found this summer was amazing and resourceful people who were without the resources necessary to evolve past present problems, and many factors that were beyond our control, which was hard for me, but a major learning experience. The seeds planted in my mind and in my heart this summer (and the mangrove seeds physically planted in the greenhouse that Jalimer and I built during my first days in Rincon) will continue to blossom for many years to come, and that’s priceless. Thanks for following along. Tio Sam, signing out. This entry was posted in Samuel Blakesley. Bookmark the permalink.